The Verge claims it's got its hands on an image of Amazon's new Kindle Fire being announced next week. We're dubious. It's certainly possible, since we're almost certain that we'll see a new Kindle Fire, since the current Fire is sold out at Amazon. But gosh, that bezel looks weird (read: very possibly Photoshopped), and the camera placement is just bizarre for a 4:3(ish) tablet. Other tablets have similar placement, but they're generally 16:9 and meant to be held in landscape. Plus, it looks to be a different aspect ratio than the current Fire. The 4:3ish aspect ratio could be due to the fact there's a rumored 10-inch Kindle Fire coming. 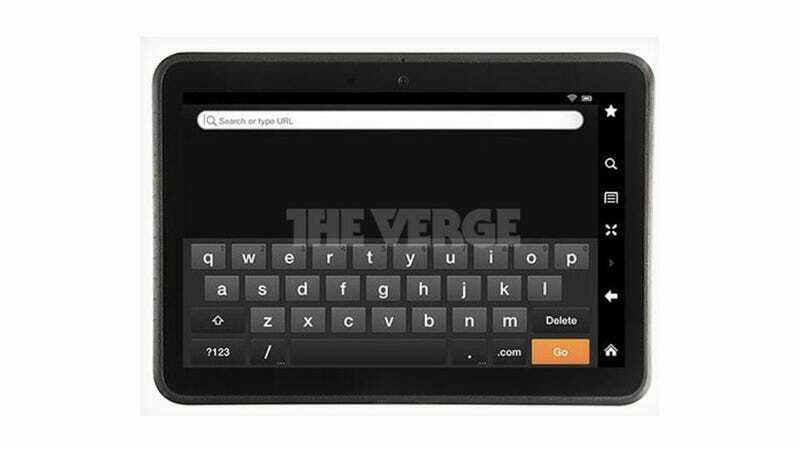 But the keyboard is also drastically different from the current Kindle Fire's. Update: The Verge has updated its post to say that a second Amazon source has definitively stated that this is NOT the new Fire. As you were.